You’ve earned this. You’ve got the guts. You’ve got the reflexes. Most importantly, you’ve got the need. The need for speed, that is. You’ve proven you have what it takes to join the Top Gun Fighter Pilot Academy. Of course, there’s also that little bit about being an actual pilot before getting in! That takes years of practice and plenty of hours of flight time. You also need to enlist in the United States Navy and you’ll have to undergo rigorous training for years. You might even have to deal with an intense rivalry with a guy named Iceman. Maybe there’s a slightly easier way to attain the rank of ace fighter pilot. Perhaps if you just wear this officially licensed Top Gun jumpsuit costume, you’ll look like a professional fighter pilot without any of the hassle! This plus size Top Gun flight suit costume recreates the look seen in the classic movie from the 1980s. It comes with a dark green jumpsuit that has a zip-up style front. It has zippered pockets in the front and along the legs. The front of the vest has various patches, including a Top Gun patch and a “VF-1” patch. It also has a name patch on the chest. The shoulder also has patches to add to the authentic style. It also comes with a baseball cap, which has a Top Gun logo on the front. 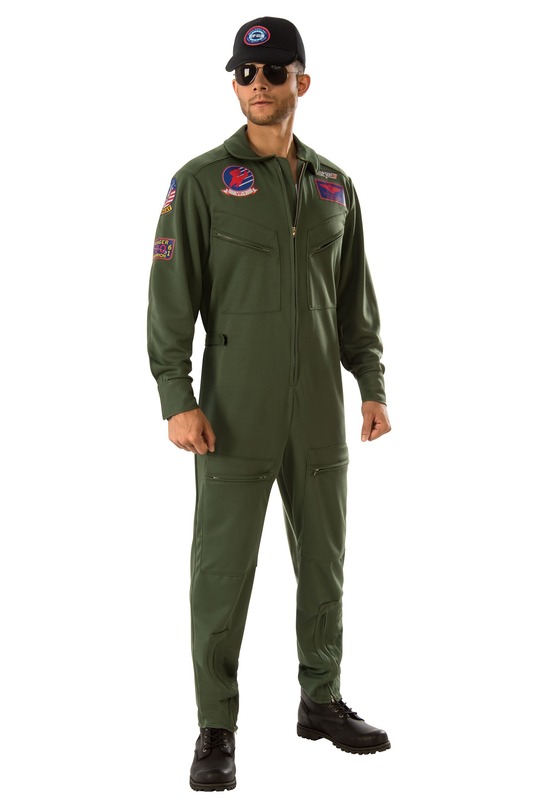 Just suit up in this plus size Top Gun costume and you’ll be ready to fly the skies… or least, you’ll be ready to act like a flyboy at the next costume party. Make sure to pair it up with your favorite pair aviator sunglasses to really amp up the look to be like the one and only Maverick! It'll have you looking like the best in class.